Even the corporate-run media is borrowing the label “policing for profit” to describe the practice of civil asset forfeiture by the police force. 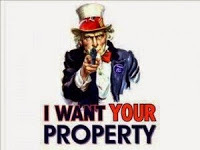 That is, seizing property, money, cars and even homes without any type of due process. Not even a charge. All of your “donations” benefit the vicious cycle, and anything the offices want. A comedic approach to the subject comes from John Oliver’s show. Released footage of a New Mexico attorney at a “Vehicle Forfeiture Conference” – yes, that was the actual seminar title – is quickly gaining ire. In it, the Las Cruces city attorney, Harry S. Connelly Jr., encourages the police practice of seizure like he’s a multi-level marketing guru motivating his underlings to look at everyone as a potential dollar sign. Really, the analogy fits – a report from theInstitute of Justice documents that prosecutors (and the State) get a part of the cut. Officers intently listen to techniques about maximum profits, arguing in court, getting past objects of innocent victims and keeping the loot. If you watch the full footage of Connelly’s remarks, you can see how NM police ensnared a man for almost touching his own car after leaving a bar. And he expresses sorrow for the officers (and himself) who had to give back the 2008 Mercedes Benz because they didn’t wait just a little longer for the snag. It would have made such a nice haul at auction – right, because, that’s the saddest thing about this scenario. But he encourages going after nice cars. Obviously, policing has become goods-driven, not safety-driven. Trouble is – this released “oopsie” is indicative of many such conferences and the prevailing attitude of police and other agents acting no different than the literal highway robbers of yore. And if they can get a dog to “hit” your vehicle, then they open the door to find money and things to sell. But according to the typical seminars, not jewelry because it’s hard to unload and not computers because nearly everyone has one. Step-by-step instructions on getting and selling “little goodies” and big ones too.